ScotRail currently operate a fleet of 39 Class 170 "Turbostars", all based at Haymarket Depot in Edinburgh. An initial order for 24 three car units (170401 to 424) was placed with Adtranz in 1999, when Scotrail were under the tenure of National Express. A further 2 units (170470 and 471) were recieved as part of a compensation deal with the manufacturer. 10 more units numbered as 170425 to 434 followed in 2003/4 - these make up the Express pool along with the initial 24 units. In 2004/5, the 7 SPT pool units (170472 to 478) and 12 Suburban units (170450 to 461) were delivered. In 2015, units 170421-4 were transferred to Southern and have since been reclassified as Class 171 (171201/202 & 171402/402), with the fitting of Dellner couplers. 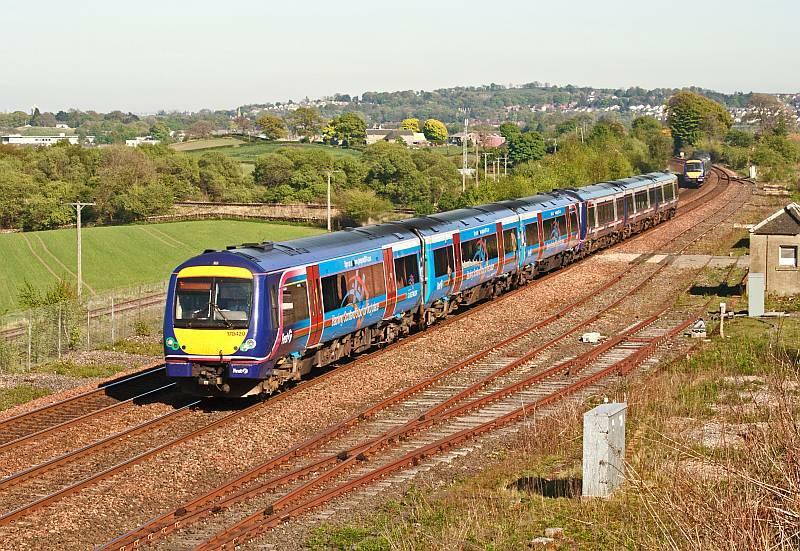 Sixteen Class 170 units, 170453-170461 & 170472-170478, have transferred from ScotRail to Arriva Rail North in 2018-2019 and operate local services in the Leeds area. The Class 170 Express Pool formed the mainstay of the 170 fleet until mid-to-late 2018 and the units seen heavy use on services between Edinburgh, Glasgow, Aberdeen, Inverness, Perth and Dundee. Peak time services between Edinburgh and Glasgow were diagrammed for pairs of Express 170s. First class accomodation was provided as built. All units are now painted in Scotland's Railway livery. With the electrification of the Edinburgh & Glasgow Mainline complete, EMUs now operate services on this corridor, releasing Class 170 units for other work. Also, refurbished & classic HST sets have begun to replace Class 170 units on InterCity services between Glasgow/Edinburgh & Inverness/Aberdeen. In 2015, 170421-4 were transferred to Southern whilst 170416-20 are expected to follow in August 2019. In 2005 First Scotrail aquired four Turbostars from Hull Trains. When they arrived, these units were operated in Hull Trains green and white but were quickly revinyled into standard First ScotRail livery. The interior fittings of these units differ from Scotrail's in a number of ways, most notable was the provision of a buffet counter in the centre coach. These sets are not operated on dedicated diagrams and can be found on any class 170 working. All of the 170/3s are in the saltire livery. The buffet area in these units was removed towards the latter end of 2017, allowing for more seating in it's place. Twelve suburban units were ordered, numbered 170450-170461, mainly to operate Fife local services as well as Edinburgh to Newcraighall, Bathgate and Dunblane services. Initially, the Suburban pool units were kept to the above diagrams as much as possible as first class accomodation was not provided. Units 170450-170457 were subsequently fitted with First Class accommodation as per the Express Pool and could be found working any Class 170 diagram. As of February 2019, only 170450-170452 remain with ScotRail from this batch, the remaining units having transferred to Arriva Rail North. Nine Class 170s wore SPT livery (170470-170478), with non standard green and orange interiors. These units formerly worked almost exclusively on SPT sponsored Glasgow Queen Street to Stirling/Dunblane/Cumbernauld/Falkirk services. However, the units were maintained and operated by Scotrail. Latterly, these units could be used on any class 170 diagram - although First Class was not provided. These nine units all wore the 'Saltire' livery with 170478 being the last in the SPT colours repainted in May 2014. 170472-8 were transferred to Arriva Rail North in 2018, leaving only 170470/471 working with ScotRail. Class 170s have occasionally operated as two car sets when the centre coach (56 car) fails on an otherwise healthy unit. 170401 was delivered in this manner - with 170402 being delivered with 56401 in it's formation in addition to 56402. Another four car set was formed in July 2000 when 56408 was inserted into 170407 and again in November 2000 when the centre coach from 170412 was inserted into unit 170417. See this thread for details. Two units briefly carried advertising liveries in 1999. 170414 wore silver, promoting The Herald newspaper while 170415 was decked out in dark blue with orange spots advertising the Sunday Herald ("No ordinary trainspotter"). The adverts covered the entire centre coach of each unit. In Spring 2015 170414 was painted in a special livery to promote the reopening of the Borders Railway in September 2015. In Summer 2007, 170420 and 421 were revinyled into "Back The Bid" colours to support the City of Glasgow's - ultimately successful - bid for the 2014 Commonwealth Games. The scheme was predominantly light blue with brown doors and was also worn by a number of Glasgow Subway trains. In January 2012, 170433 suffered cab damage after running into a tree during a winter storm. To replace the damaged car, the 50 car from 170425 was added to the set from the 10th of the month until the 1st of February. Notably, the latter coach was painted in the blue Saltire livery, while the 79 and 56 cars of 170433 wore Barbie livery. A second hybrid set was formed on the second of February using 50425, this time paired with Barbie liveried 56453 and 79453. The formations were corrected in April 2012. Created by SC318250 and last modified by Avenger at 01:45, 27 of February 2019.